Was it the dragon in 2010 that brought the floods? Once a upon a time during the 9th century AD in Udyana (modern-day Swat, Pakistan) there was a Buddhism tribe that were very devoted to their religion. They used to worship the Gautama Buddha, the Supreme Buddha. The people had only one wish from Buddha that their crops and grains do not grow on the farms due to drought and there is no kind of rain in the region they always believed that Buddha will answer their hardships one day. At last one day the Buddha saw his people’s hardships and send a “rain dragon” to the tribe. The people were pleased to see the dragon, the dragon brought rainfall and snowfall with him that made the farms grow crops, grains and wheat thus ending the drought period. The Rain dragon had only one wish from people, he told them that he brings rain for them so they (people) can eat and live happy thus he wants a big festival and tribute for himself every month, the people agreed on this happily. But one month the people forgot the dragon’s wish as they were busy harvesting the crops and grains. This caused a devilish awakening in the dragon that made him angry at the people therefore he unleashed massive floods and storms that destroyed the people’s region. The Buddha was watching the wrath of the dragon from the sky the whole time thus he sent a warrior tiger to save his fellow-men. By this time the floods had reached Sindhu (modern-day Sindh) and were about to fall in the Sindhu Sagar (modern-day Arabian sea). The warrior tiger jumped from the sky and landed on the land where once those people used to live, the tiger attacked the Rain dragon, who at that time started obeying Satan. 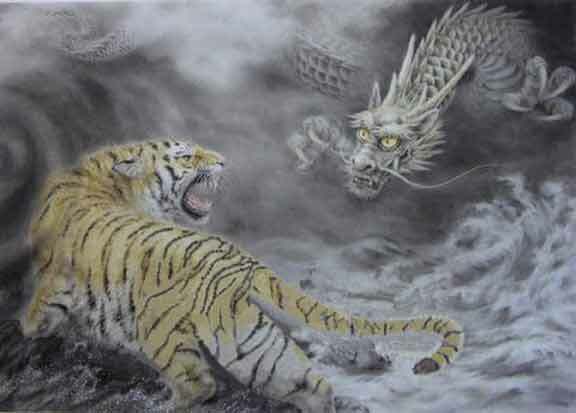 The tiger somehow managed to capture the dragon and placed him in a cave from which the dragon can never get out. The Buddha took his powers away from him but the dragon told him that he will once again have his revenge on the people and floods will soon erupt from Udyana to Sindhu Sagar. Amazing article, and its historically correct. I haven’t heard about this myth before, but its true that during this time (9th AD) Swat valley was mostly devoted to Buddhism. And also Sindh used to be called Sindhu (The word ‘Hindu’ is derived from Sindhu). The celtics during the iron age also had similar myths regarding harsh weather, so did the Nordics. Amazing artilce, vey well written. Two thumbs up! You know, in ancient greece, Zeus the father of Hercules was the God of sky, rain, weather etc. His weapon was a thunder bolt/lightening. And I think Thor, from Norse polytheism was also the God of thunder. Thats true…but good thing about this “dragon myth” is that it was made in Pakistan..
Good article. I wonder if the pakistan media also reported on this story during the floods? Though it is obvious that they are too uneducated to know such things.